Martha's recipe for these cute jack-o-lantern tarts obviously includes making the pie dough from scratch and creating a gorgeous filling. I am sure the recipe is delicious, but if you are a little short on time, you can easily create the same cuteness with some store bought freezer dough or pastry dough and your favorite pie recipe. I think the cute pie crust jack-o-lantern faces would be great on a chicken pot pie too. An easy Halloween dinner. 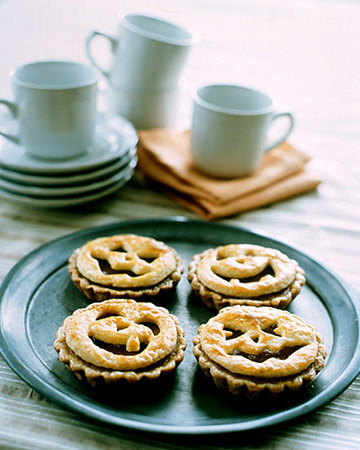 You can get the recipe for these Halloween tarts over at Martha Stewart.